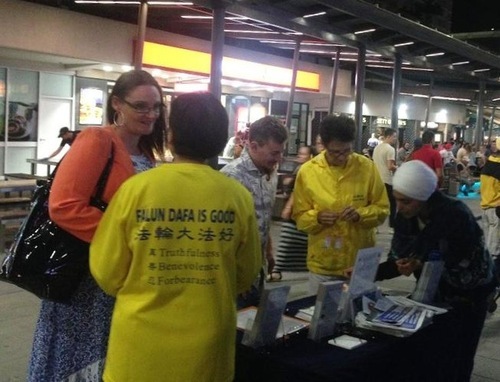 Falun Dafa practitioners held an Information Day event at Gold Coast Surfers Paradise on November 9, 2018. Many tourists and local residents, including many Chinese tourists, signed a petition calling for an end to the persecution of Falun Gong in China. Falun Dafa, also called Falun Gong, is a spiritual practice which follows the principles of Truthfulness-Compassion-Forbearance. It is an ancient Chinese practice introduced to the public in 1992 by Master Li Hongzhi. Maryann, who organised the event, said they picked this location because it is a must-see for tourists and there was an evening market which brings in a lot of people. Maryann, the event organiser, introduces Falun Gong to visitors. 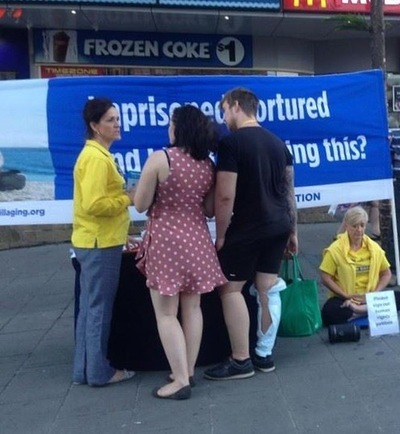 Some Chinese tourists were surprised to see a Falun Gong activity, as it’s something they have not been able to see in China since before the persecution. A middle-aged Chinese man talked to a practitioner for a long time, asking questions about the practice and the persecution. In the end, he decided to take stance against the communist regime’s atrocities by withdrawing his membership in the Youth League, an organisation affiliated with the Chinese Communist Party. Since the movement to quit the Chinese Communist Party began in 2009, over 300 million Chinese have quit the Party. Visitors learn about Falun Gong and sign a petition to end the persecution in China. Grace, a practitioner volunteering at the event, said they talked to a lot of people and had them sign the petition. People were still stopping by to learn and show support as the event was wrapping up.